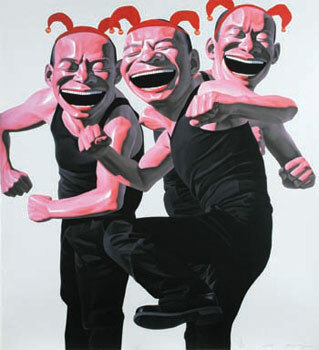 Tokyo Art Beat / New York Art Beat is proud to participate as a media partner in Asian Contemporary Art Fair New York, held from November 6-10, 2008, at Pier 92, 52nd Street and 12th Avenue in NY City. Please come visit us at media booth 106 to say hello and meet the people behind NY Art Beat and Tokyo Art Beat. At Asian Contemporary Art Fair New York, more than 60 international galleries and non-profit organizations will show a wide range of contemporary work by artists from countries including China, Japan, Korea, India, Bangladesh, Philippines, Singapore and Vietnam. Much of the work, including paintings, sculpture, photography, works on paper, video and installations, will be on view for the first time in the U.S. The Asian Contemporary Art Fair New York is the only international art fair in New York dedicated exclusively to Asian contemporary art. Last year’s inaugural fair was hailed as a major success, providing collectors with an unusual opportunity to gain an overview of Asian art and see work by emerging artists, as well as internationally-recognized names such as Zhang Xiaogang, Nam June Paik, Yue Minjun and Yayoi Kusama. * Thursday, November 6; Preview Opening (Invitation only) – 5 p.m. to 9 p.m.
* Friday, November 7 – 11 a.m. to 7 p.m.
* Saturday, November 8 – 11 a.m. to 7 p.m.
* Sunday, November 9 – 11 a.m. to 7 p.m.
* Monday, November 10 – 11 a.m. to 6 p.m.